and improvement for commercial buildings and Facility Management companies. 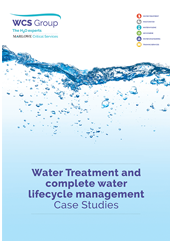 WCS Group maintains one of the largest water treatment teams in the UK with proven systems and practices improving water quality, water purification, water re-use and waste management, risk management and data visibility for tangible results. We manage the whole water lifecycle from pre-water treatment to re-use and effluent water treatment and environmental discharge. Separate downloads are available for water engineering (incorporating waste water) and water hygiene.